The remodeling industry reported that more people are taking on remodeling projects to increase home value and enhance their environment. 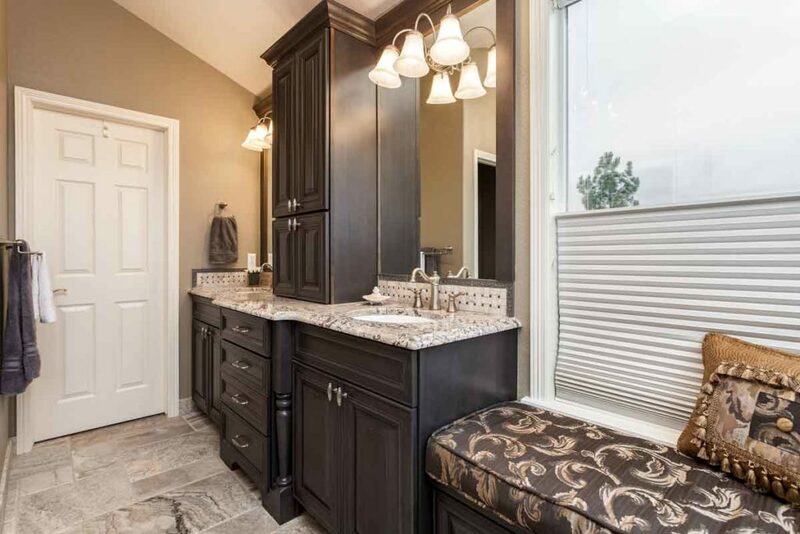 We have found among our clientele that time is their most important asset, and they come to us knowing that we can be their one-stop shop and manage their kitchen and bath remodeling adventure from start to finish. Trends ranged from customizable faucets to bold-colored appliances and everything in between. It was hard not to be impressed by the continued technological connectivity and integration of kitchen appliances and bathroom fixtures. Appliances finishes showed many pops of color. What we did not see a lot of was traditional stainless steel. Colorful hues dominated at the 2019 KBIS along with black stainless. One appliance manufacturer has incorporated sou vide cooking capabilities into a standard 36-inch range. Another manufacturer featured a dual fuel range that combines induction burners with gas countertops on the stove top and a dual oven cavity that enables home cooks to roast a giant turkey on one side and cook vegetables on the other. There are now ovens that allow you to cook by function, food or recipe and can even convert the stars of HGTVs “Worst Cooks In America” into gourmet chefs. Don’t worry if you don’t know how to cook or don’t like to, there are ovens that ask you to dial in the attributes of what you want to cook, and you can set it and then forget it. One of the cooler new appliances unveiled at KBIS was Miele’s active steam ironing board. There is a heating element in the pad that helps to warm clothing before the iron touches it, thus enabling the steam from the iron to evaporate more effectively. Fans in the board help to billow clothes, and that helps fabrics such as wool and cashmere keep their shape. More than 2.1 billion tons of food worldwide will be tossed in the garbage can by 2030, predicts the Boston Consulting Group. And the United Nations Food and Agriculture Organization reports that food waste and loss accounts for 8 percent of global greenhouse gas emissions. Both the amount of food waste and the greenhouse gas emission that waste generates could be substantially reduced thanks to a new mobile food scanner that is expected to hit the market later in 2019. The pocket-sized scanner is being developed by a German research organization and uses an infrared sensor to determine the safety of fresh food, which is measured using an app on a smartphone or tablet. A lot of edible food is discarded prematurely because of blemishes or because it has lasted beyond its past use by date. Consumers have no way to determine if blemished or expired food is still safe to eat. Most consumers would rather be safe than sorry, contributing to a lot of unnecessary food waste. The scanner and app developers hope that their new technology will curtail needless food waste. The scanner uses a near-infrared sensor to determine the ripeness of food. Artificial Intelligence converts the sensor readings into inferences about the safety of the food scanned. Currently, the technology is only capable of determining the ripeness of a single ingredient. You can’t scan a plate of leftovers to decide whether they have gone bad nor can you assess the safety of pre-prepared food. However, the researchers developing the technology plan to expand applications across multi-ingredient foods soon. An added bonus of the technology is that the scanner can determine the authenticity of the food scanned. For example, it can determine the difference between real crab and manufactured crab and the difference between salmon and salmon trout. The scanner is further evidence of how technology will continue to change the way we prepare meals and eat. Kitchens are becoming more connected with new applications coming to market almost daily. If you would like to know how you can take advantage of new technologies that enhance your family’s lifestyle, health and well-being, give us a call. Some refrigerators allow you to check their contents from your smartphone while at the grocery store or any other place. Others feature computers that enable you to store recipes, make grocery lists or order via your home assistant. Zoned refrigeration continues to evolve and allows you to store foodstuffs and beverages at the perfect temperatures. Another trend is the growth of beverage stations. Whether you want a built-in coffee station or a wine dispenser, there is an appliance that can meet your needs. Renovations to help our clientele age in place are trending upward. Both Baby Boomers who are looking to stay in their homes longer and Generation X who are modifying their homes for parents who are coming to live with them is fueling demand for universal design renovations. This type of remodeling focuses on accessibility and ease of use, exemplified by curbless shower enclosures and grab bars in tubs, showers and water closet areas in bathroom remodels, first-floor bedrooms, wider doorways and handrails throughout the home. 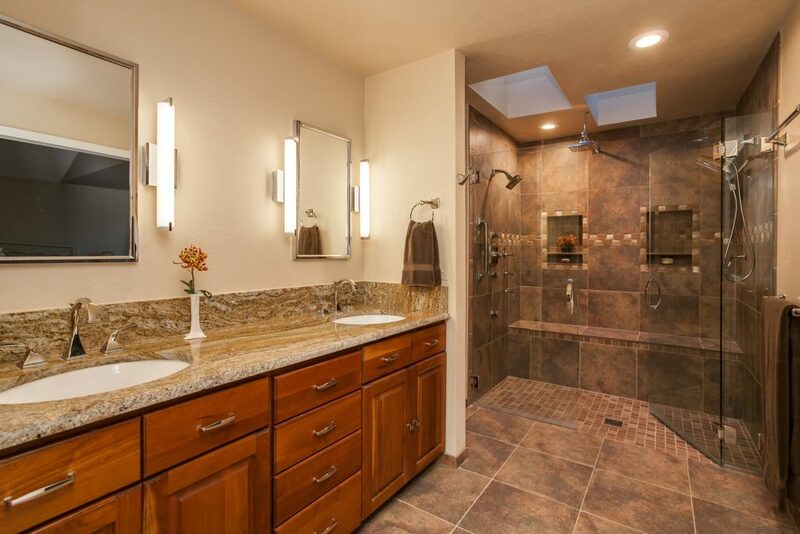 In master bathroom remodels, many of our customers are opting for shower systems and foregoing a tub, especially if there are tubs in other bathrooms in the home. A walk-in shower delivers different relaxation benefits than soaking in a tub, and many of our customers do not have time to soak in a tub. The ability to customize fixtures such as faucets and tubs is becoming much easier. We saw more air massage tubs than jetted tubs. At KBIS, we saw a few head-turning bathroom faucets. The first, a 3-D printed faucet from DXV by American Standard. The Blade is printed from stainless steel then hand finished. Water flow is activated by a sensor that turns on and off as a user approaches or leaves. Water flows from a circular opening in the edge of the faucet. Axor unveiled its MyEdition Customizable Cover Plates. You can select from six cover plates made from leather, wood, two types of marble and mirrored or black glass for the sink and tub faucets. White and gray are the most popular colors selected by our clientele for kitchens and baths. These colors offer clean, timeless looks. Other trends in the kitchen include quartz countertops and luxury vinyl floor coverings that are extremely durable and come in an almost unlimited pallet of looks and textures. 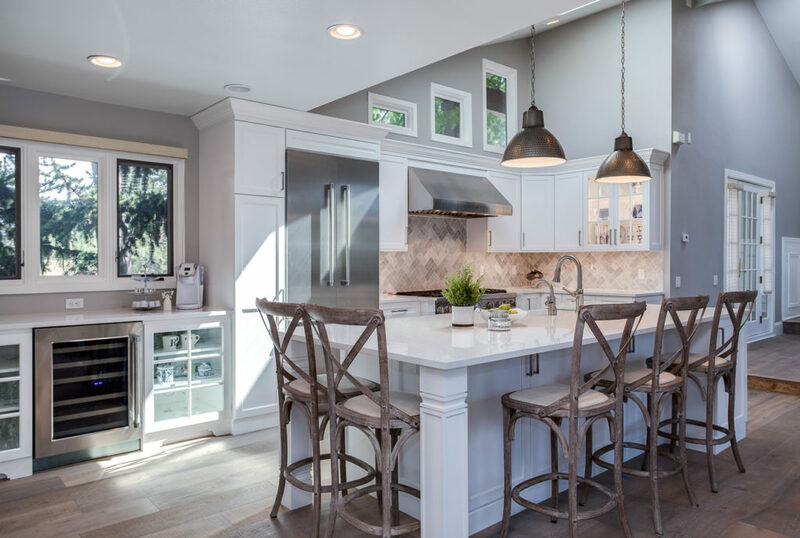 A recent analysis of kitchen trends by one of the largest manufacturers of kitchen cabinets in North America offers some interesting insights to help you plan your kitchen remodel. 59% of kitchen renovations involve changing the kitchen’s footprint to be more open and to include other rooms in the home. 49% of kitchen remodels increase the kitchen size. Mixing materials is another hot trend with 49% of designers stating that they believe mixing an opaque with a stain is a top trend. A play on that is a contemporary look that mixes metals with traditional accent pieces. Cherry and maple continue to dominate stained cabinet sales, but there is a growing trend for wood finishes that show more grain and character. Greige tones – Gray and beige combined, This is a warm grey color that looks like yesterday’s oatmeal. It’s become wildly popular. If it’s darker then the color is bray, brown and gray. This decade has produced some very pleasant new kitchen trends. One is sinks that serve multiple purposes and functions. Clients, especially those who like to entertain, are drawn toward trough sinks that can be used to chill wine or shellfish, grow herbs and function as a regular sink. Our clients appreciate the wow factor a trough sink has in their new kitchen, especially when the sinks are equipped with LED lights that change color. The kitchen sink can be a design statement yet, too often, it is an afterthought. Sink sizes, shapes, and available materials influence the overall look and feel of a new kitchen. Functionality is another consideration from the noise that results from running water or placing pots, pans, and plates in the sink, to the ease of use. 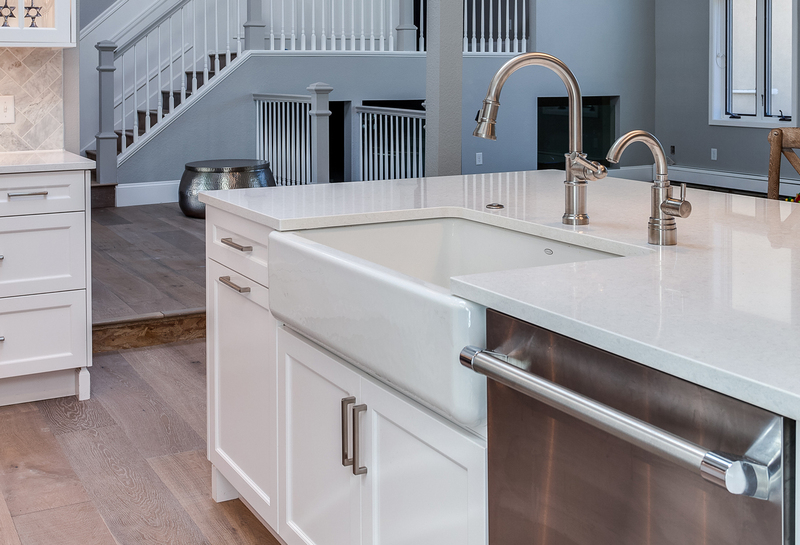 There are sinks today that function as complete workstations, providing another area in the kitchen for meal preparation, chopping, washing, serving and entertaining. And many of our customers, when asked if they want more than one sink in their new kitchen, respond with a resounding yes. The kitchen faucet is the showpiece of the kitchen area and happens to be the most used appliance in the home. Manufacturers are making smart faucets that can be activated by apps, a wave of the hand or a tap of an elbow. Smart touch faucets are greatly appreciated by home cooks, especially bakers. Similar to a gorgeous outfit, accessories can make the sink area and kitchen more functional and beautiful. Instant hot and cold water, soap dispensers, air gaps, colanders, strainers, chopping boards, dish racks, drying mats and protective grates are among the numerous accessories to enhance the functionality, look and performance of a kitchen. Lighting sets the mood for any space and it certainly has come a long way in the kitchen. One of the hottest trends is integrated LED lighting in, above and below cabinets and drawers. Perched above cabinets, as well as hidden inside and under them, integrated kitchen lighting adds atmosphere, functionality, and style to a kitchen. They’re a brilliant way to complete the look of your kitchen and get a better look at what you’re making for dinner. Under cabinet lighting makes tasks easier and safer by delivering directed light to a specific area. Under cabinet lighting can provide task lighting for countertop food preparation and accent lighting to highlight countertops and backsplashes. Under cabinet lighting also helps to eliminate shadows making it easier to prepare meals. Additionally, under cabinet lighting helps to create unique looks by adding another layer of light and it’s extremely affordable. Integrated cabinet lighting can showpiece dinnerware, collectibles and objects d’art. Integrated cabinet and drawer lighting also makes organizing and finding what you are looking for much easier not to mention the wow factor that is achieved every time you open a drawer or door the interior of the space is illuminated. Open shelving provides numerous options. It’s functional, providing storage and organization to a kitchen. It contributes to the look and feel of the room, allowing our clients to express their personality by showcasing works of art, pottery, collectibles, cookware, chinaware, glasses, plants, flowers, herbs, and objects d’art. Living walls create an art piece from sustainable vertical gardens indoors and outside as well. In the kitchen, you can install living walls that do not require watering, natural light, fertilizer or pruning. In addition to being exceptionally cool and visually stunning, vertical gardens help absorb sound, preventing conversations and acoustics from the kitchen from traveling to other rooms in the home. Storage solutions continue to evolve not only for the kitchen but also for the bathroom. We saw many shallow upper cabinets designed for the bath that can be recessed into the wall to avoid having to dedicate countertop space for storage. Another bath trend was the use of two to three different tiles in the bath, combining small-scale mosaics with 4 by 6-inch wall tiles and 12 by 24-inch floor tiles. 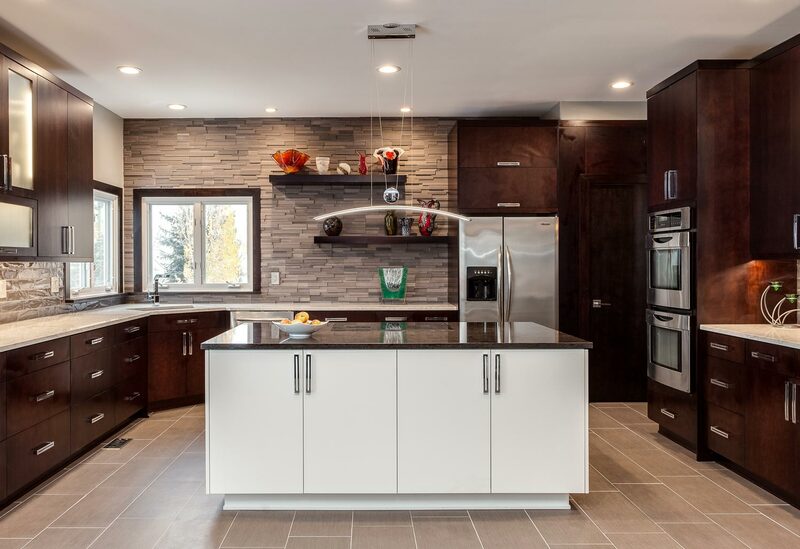 To learn how you can capitalize on new technologies, storage solutions and the latest industry trends to help create a dream kitchen, please schedule a consultation here, drop by one of our showrooms or give us a call.